Kiwis are losing their in record numbers but they’re leaning into life in diverse ways, which would make complete sense to the late theologian James Fowler. After interviewing nearly 600 people, not a bad sample for any research, Folwer reckoned faith is the way we lean into and make sense of life. It’s not necessarily religious or about belief, on the contrary, faith is universal. As the blurb on the back of his best seller Stages of Faith says, ‘everyone who chooses to go on living operates by some basic faith’. How people lean into life matters at any time but particularly when we are sick, dying or ageing. 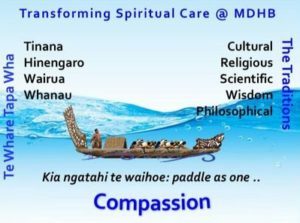 Understanding how each person does this and helping them harness that powerful source of hope is at the heart of the MDHB Spirituality Strategy updated July 2018 adopted by MidCentral District Health Board. However, it’s not easy to get traction when spirituality has largely been captured through a religious lens, which in our case has been Christianity. So, first we had to figure out where we were and, in the light of changing demographics and international research, what the future needed to be. The existing and future diagram below captures illustrates our thinking. My job as Spiritual Care Coordinator is to help make this happen. None of it is easy, particularly in New Zealand where conversations about spirituality must quickly cut through the worry that we might be on about religion, or a religion that has no meaning for the person in front of us. Couple this with our responsibilities under The Treaty of Waitangi and working in a refugee resettlement area that hosts new Kiwis who bring a diverse mix of religious experience to their meaning making. Key to success is creating a culture change through a renewed understanding of spirituality as an integral part of healthcare and integrating spiritual care into practice. We’ve come a long way in the last six years but the mountain is of Everest proportions. What often keeps me going are the stories of faith that people share with me day after day. Some are about religious practices and beliefs but most of them are about the unique and varied ways people lean into life to make meaning, sometimes in tragic circumstances. James Fowler was right. I wish we’d listened to him earlier because having faith in healthcare really does matter. Next Waru the movie: questioning patriarchy?